The oldest hand-written passages from the Hebrew Bible identical to versions in use today have been identified by researchers using digital technology to read an ancient scroll. The relic, which had been too fragile to unwrap, was deciphered by Israeli and US experts using an X-ray scan. It contains passages from the Book of Leviticus dating back to at least the 3rd or 4th Century AD. The charred scroll was found in 1970 amid the remains of an ancient synagogue. Archaeologists found it buried in the ark of the synagogue near the Dead Sea, where it would have been used for prayers. Researchers in Kentucky and Jerusalem were able read it using three dimensional digital analysis of an X-ray scan, the Science Advances Journal announced. "Not only were you seeing writing, but it was readable. At that point we were absolutely jubilant," said William Brent Seales of the University of Kentucky's computer science department. Scholars say the text in Ein Gedi - in standard Hebrew - offer the first physical evidence of a long-held belief that the version of the Hebrew Bible used today goes back 2,000 years. The text is "100 percent identical" to the version of the Book of Leviticus that has been in use for centuries, said Dead Sea Scroll scholar Emmanuel Tov from the Hebrew University of Jerusalem, who participated in the study. This was the first time researchers had been able to read ancient documents without physically opening them. "We were amazed at the quality of the images," said Michael Segal, head of the School of Philosophy and Religions at Hebrew University of Jerusalem. "Much of the text is as readable, or close to as readable as actual unharmed Dead Sea Scrolls or high resolution photographs of them." Researchers hope the new technology will enable them to read other antique parchments like some Dead Sea scrolls and papyrus scrolls that are too brittle to unwrap. "You can't imagine the joy in the lab," said Pnina Shor, head of the Dead Sea Scrolls preservation lab at the Israel Antiquities Authority. 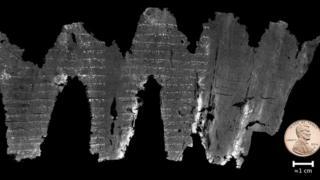 Prior to this discovery, the oldest known fragments of standardised biblical text dated back to the 8th Century AD. Researchers said the discovery held great significance for understanding the development of the Hebrew Bible.